Set in a quiet village behind a picket fence and enveloped by garden, Chris and Alison’s thatched cottage is at its best on a glorious summer’s day; its front borders brimming with a mix of rose bushes, petunia-filled hanging baskets, fuchsias and hollyhocks bobbing in the breeze. 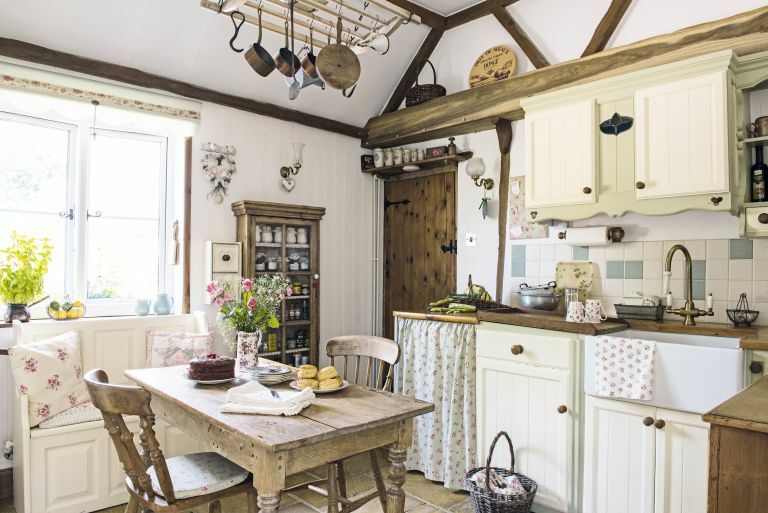 Inside, the house has all the ingredients of a rural English cottage: low ceilings with rustic beams, a deep inglenook and flagstone floors, bound with a timeless country charm. Find out how they transformed the cottage, then browse through more real home transformations and find out how to renovate a house. 'We’re never living in a period property,’ said Chris Young to his wife Alison, after helping to renovate their daughter’s 16th-century home. But when it came to relocating from Cornwall to Wiltshire to be closer to family in 2010, Chris and Alison were charmed by the original features of a 1700s chocolate box thatch, which they have since discovered has far more to it than meets the eye. Set in a quiet village behind a picket fence and enveloped by garden, the cottage is at its best on a glorious summer’s day; its front borders brimming with a mix of rose bushes, petunia-filled hanging baskets, fuchsias and hollyhocks bobbing in the breeze. Inside, the house has all the ingredients of a rural English cottage: low ceilings with rustic beams, a deep inglenook and flagstone floors, bound with a timeless country charm. The survey also revealed details of the cottage’s piecemeal evolution, including a wing added in the 1800s and the conversion of an adjoining barn into a kitchen in the 1950s. Unlike previous generations, Chris and Alison were determined to limit structural changes to essential maintenance, seeing themselves as custodians tasked with preserving the property’s pretty period features. In the master bedroom an exposed beam partway through the wall indicates the original roof line of the cottage before it was raised and new windows were installed by later generations. Low ceilings and narrow access meant that it was tricky to accommodate big pieces of furniture, so Chris and Alison extended an existing wardrobe and picked up a selection of old leather luggage cases from flea markets, which can be easily stored above the wardrobe and under the bed. Chris and Alison have also turned the uninspiring outdoor space into a pretty garden befitting the charm of the house. Step outside and you notice the garden is a continuation of the living space, cleverly zoned by strategically placed plants, fencing and furniture into a series of outdoor rooms.